All the info you need to know about buying tickets. General release tickets for each show go on sale at Belvoir throughout the year as the shows approach. On-sale dates are on each production’s page on the website. The table below shows the non-subscription ticket prices. Ticket prices can be dynamically adjusted, either up or down, based on real-time market demand, and without notice. Please contact the Box Office for up-to-date prices as each show goes on sale. Remember: if you are a subscriber you are entitled to purchase additional tickets at a discounted price for all Belvoir performances, so you can bring along family and friends. And when tickets go on general sale throughout the year, as a subscriber you can purchase them one week before non-subscribers. † Concession prices are available with a full-time student card, Centrelink Pensioner concession card, Veterans’ Affairs cards, and to Industry members of Actors Equity (MEAA), AFI, ASMA, ASDA, ARDA, ACTT, Australian Academy of Dramatic Arts, Actors Centre, Performance Space, Australian Writers’ Guild, ArtsHub and Writing NSW. ^ Tickets to Saturday and Sunday performances may have an added $5 surcharge. To claim any concessions you must provide proof. Transaction fees may apply and prices may be subject to change. Please note: the price paid at time of purchase is final. To book your theatre tickets online for any Upstairs or Downstairs Theatre performance, simply go to our What’s On page and if tickets are on sale for a show either hover your mouse over the image of the production until the Buy Tickets button appears, or click through to the relevant production page then click on the Buy Tickets button on the top right of the page. Please arrive at the Box Office at least 30 minutes before the start of the performance to collect your theatre tickets. Our online ticketing Terms and Conditions appear as part of the buying process before you complete your online transaction. Please note: there is a $5 transaction fee for tickets booked online. Online bookings close 30 minutes prior to every performance. To book your theatre tickets over the phone call the Box Office on 02 9699 3444. During busy times (especially after 5pm) your call will be placed in a queue and answered in strict rotation. Your tickets will be available for collection at the Box Office on the day or evening of your performance. Please bring your concession/industry card or other proof of financial membership to the theatre when you collect your tickets. Payment can be made by Visa, Mastercard and American Express. Please note: there is a $6 transaction fee for tickets booked over the phone. Phone bookings close one hour prior to performance times. Tickets can be purchased in person by credit card, eftpos or by cheque. There is no booking fee for counter sales. Please make sure you bring your concession/industry card or other proof of financial membership to the Box Office with you. Tickets can be reserved without payment for up to for 48 hours. Please note, if the performance being booked falls within the 48 hours, tickets need to be paid for no later than 24 hours prior to the performance. Tickets cannot be refunded after purchase except as outlined in the Live Performance Australia Ticketing Code of Practice (see downloadable PDF at upper right). Tickets may be exchanged, subject to availability, up to 48 hours prior to your booked performance. Ticket exchanges are only possible for a different performance date of the same production. Further conditions and fees may apply. For every performance that is sold out: if waitlist tickets become available (there may not be any availability for some performances) they can be purchased from the Box Office in person only 1 hour prior to the commencement of the performance. A Belvoir subscription or single tickets gift voucher is a lovely gift idea – any of our packages will warm the heart of your loved ones! A 30-Down subscription is a really great way to give a young person the life-changing experience of regularly attending live theatre. Buy gift vouchers online or give our Box Office staff a call on 02 9699 3444. Tickets may be exchanged, subject to availability, up to 48 hours prior to the performance stated on the ticket. Please fill in the following form to request a ticket exchange. Please note, submitting the form does not guarantee your exchange. The Box Office will receive your request within 24 hours and respond. Click HERE for the exchange request form. Subscribers are entitled to one free exchange per ticket. Subsequent exchanges incur a fee of $3 per ticket. If tickets exchanged 24 hours prior to the performance stated on the ticket are subject to a late exchange fee of $6 per ticket. Tickets can be exchanged for a different performance date of the same production. We are unable to offer exchanges into a different production. If you select new tickets that are more expensive than your original ones, you will be charged the difference in the ticket prices. All exchanges are subject to ticket availability. Tickets cannot be exchanged for sold out productions. Refunds are only offered for specific and unusual circumstances, such as an event cancellation. All tickets sold by Belvoir St Theatre are issued subject to the Live Performance Australia Ticketing Code of Practice. Refunds are not available where an exchange is made to a cheaper ticket type. Late exchange fee of $6 per ticket apply for all tickets exchanged up to 24 hours before your performance date. No exchanges are made on the day of the performance, and no refunds are available. Through our Community Access program, we present one free performance per production for unwaged audiences. Tickets cannot be issued in advance and are available one hour before the performance. Check individual production pages for dates and times. To claim your complimentary ticket: visit the Belvoir Box Office in person from 12 noon on the day of the performance and present a Pensioner, Health Care Card, Veterans’ Affairs Card or MEAA or Equity Card. Seniors and Seniors Health Cards are not valid. See more information about our Unwaged Performances here. For every performance that is sold out we make limited standing room tickets available. Standing room ticketholders must stand for the duration of the performance, in a location to be determined by the Front of House staff. Standing room tickets may only be purchased over the phone or in person. Standing Room tickets are not transferrable to seats, however these ticket holders are welcome to join the waitlist for seats on the day of the performance (see below), and if successful in being offered a seat, must pay the difference in the ticket price. For sold out performances we also operate a waitlist for seats. The waitlist is available at the theatre one hour before the performance is due to commence. Please note the waitlist is only available in person, and we cannot guarantee availability. We welcome patrons who have already purchased a Standing Room ticket to join the waitlist for seats at the theatre. Tickets cannot be refunded after purchase except as outlined in the Live Performance Australia Ticketing Code of Practice (see downloadable PDF at upper right). Tickets may be exchanged, subject to availability, up to 48 hours prior to the performance stated on the ticket. Ticket exchanges are only possible for a different performance date of the same production. Further conditions and fees may apply. The right is reserved to vary advertised programs, to add, withdraw or substitute artists where necessary. Latecomers will not be given access to the auditorium unless there is a convenient break in the program and may be seated in seats other than those purchased. This ticket may not, without the prior written consent from Belvoir and the seller, be resold or offered for resale at a premium (including via online auction sites) either by the original purchaser or any subsequent bearer. If a ticket is sold in breach of this condition, the ticket may be cancelled without a refund and the bearer of the ticket may be refused admission. No recording devices of any kind are permitted in the auditorium. We have two Box Office locations: Belvoir St Theatre (25 Belvoir St) and our administration warehouse (18 Belvoir St). These hours may change during non-performance periods and on public holidays. 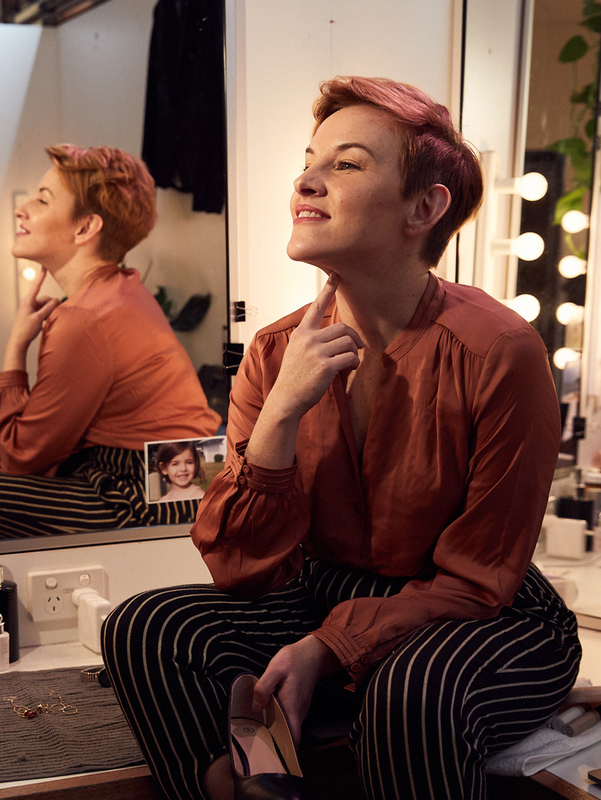 Kate Mulvany. Photo by Daniel Boud.